Next term we will be reading a book by Helen Cowcher about animals in a rainforest. We will also be studying the animals that live there and their habitats in our topic and science lessons. Tell me everything you already know about rainforests. Try to group your ideas into categories such as: climate. geography, plants, animals, insects and so on. Then post a few questions that you would like answered about rainforests. 3. I know that howler monkeys howl because they want to keep other monkeys safe and don't get hurt by people or other animals and if they howl it is because they cined of want to know were is there brother and sister are and to keep them safe and not to go somewhere else than were the family is in the rainforest. Because the family keeps every body apart because they don't want the to get lost . 1. The Amazon rainforest is the biggest rainforest in the world. 2. 70% of the plants in the rainforest is used to cure cancer. 3. The rainforest covers 6% of the world but covers 50 % of wildlife. 4. 1/4 of natural medicines ha been found in the rainforest. 5. The rainforest is called the rainforest. Rain for the amount of waterfalls that hits the forest and forest for the amount of wildlife that lives in the rainforest. 6. Every second a piece of the rainforest is being chopped down. 7. There is at least one rainforest in every country except artartica. 8. A rainforest helps climate change. The Amazon rainforest is one of the biggest rainforests in the world. Also, most of the Amazon rainforest is in Brazil - about 30%. In the Amazon is one of the biggest rivers in the world. Rainforests have different layers like the canopy, the emergent, the understory and the forest floor. On the ground is where the most wonderful animals live like tapirs, anteaters, jaguars, panthers, snakes and poisonous spiders. Deadly snakes are bound to be predators, some times they will also injure some innocent animals because they are hungry. The types of flying creatures are, blue Morfo butterflies, toucans, howler monkeys, sloths and parrots. The howler monkey is very helpful to all the other animals. They search for predators and howl when they're in danger or see another animal in danger. Rainforest deforestation is a big problem because in 2016, there was only 3,322,700 estimated square kilometers of the Amazon Rainforest left after people cutting for 46 years at it. Most of the animals are endangered species, but at least 2000 species of plants in the forests have anti-cancer properties. It also supplies a fifth of our water and keeps the weather temperatures in check. They are really good for our health because they take in carbon dioxide that we release, (a greenhouse gas) and it releases oxygen that everyone needs. Did you know that rainforests have died down by 30 percent of last 4 years all over the world. There are over 16,0000 species to be discovered. Also for medicine and sheets to keep you warm. My favourite animal in the forest is a sloth because of there behaviour and how they move so slowly. Rainforests Consists of 1800 animals.Rainforests like the Amazonia rainforest,is getting cut down, because people in big groups cut the trees down, and that wood that they use to make houses and money.If try to domesticate, a animal it will never be fully tamed because they will still have memory of living in the wild.Animals see the world different to humans,such as wild dogs sometimes see the world in shades of yellow or in black and white. 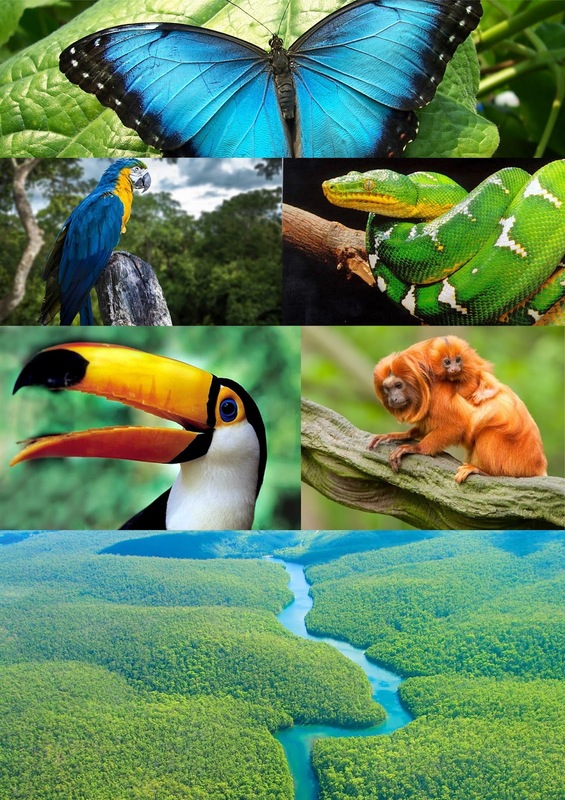 Rainforests are full of lots of different types of animals like parrots,butterflies and snakes.they all make different sounds.parrots are a multi coloured type,a butterfly also and a snake has special colours. The amozon is the largest rainforest in the world.Did you know that the rainforests covers 5 percent of the world. A rainforest is a big one and it has lots of animals it even has howler monkeys. Howler monkeys. Can shout over 200,miles away and that's loud. iknow that the butterfly is the biggest butterfly in the world . I also know that it is sometimes going to go with the queen. It is the prettiest blue I have ever seen . It drinkd from turtles tears . It wants to live in the under layer because they don't want to see there annoying ones . And they also live in the tropical rainforest of Latin America. the amazon rainforest is the worlds largest rainforest it aulso has the second largest river and it`s one of the most biodiverse regions on earth. tropical forests have been present in south america for millions of years and were at one point apread over most of the continent.as the earth cooled and grasslands spread,the rainforests retreated to strongholds like the amazon basin shrinking and growing as ice ages came and went. Snakes are danegorous and fast some snakes kill there own brother. Snakes can sqash you and they can make you not breath. 1.You can find rainforest in many not just South America. 2. Rain forest have some beautiful flowers but some of the beautiful flowers are very dangerous. 3. The Amazon rain forest is the biggest rainforest in the world .